We found 22 cans of Monster energy drink during last week’s clean up of Donkey Field, so over 100 cans for the entirety of 2017 is pretty much par for the course. 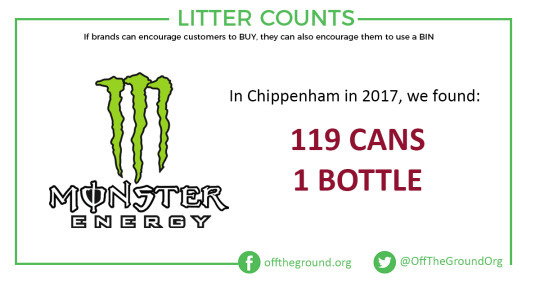 Energy drinks in general are one of the top three categories of recyclable rubbish we find on a regular basis, with alcohol-related and carbonated beverages taking the first two slots. 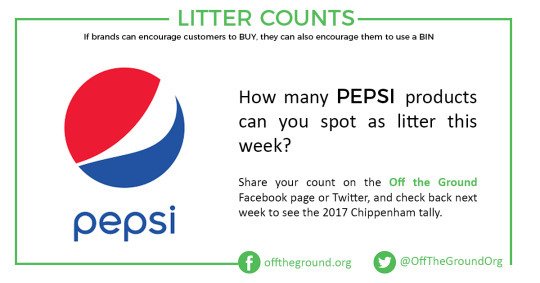 We’ve already shown that Chippenham is very much a Coca-Cola town, but how many Pepsi products can you spot in the next week? Or take a guess how many we found last year during our community clean ups.